Home » Keanu Asing Blazes To Victory At The QuikPro France! 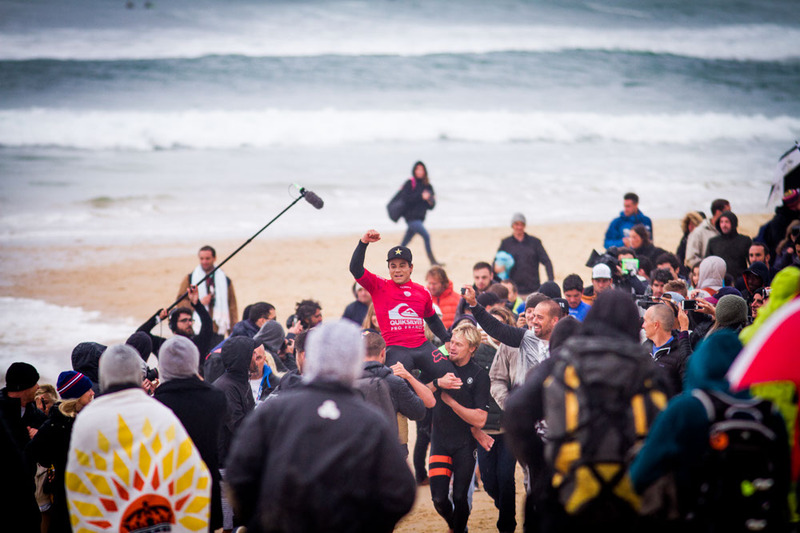 Keanu Asing Blazes To Victory At The QuikPro France! In a scenario almost no one could have predicted world number 33 Keanu Asing just blazed past world number one John John Florence and world number two Gabriel Medina to take victory in France. Tricky conditions faced the competitors on finals day today in Hossegor, with strong offshores and a small swell running, the line up was particularly shifty and hard to read. After going on hold for the entire morning, KP made the call to the move the contest site a little further up the beach, onto a small but rippable left hand bank which has been a favourite for free surfers all week. The first semi-final saw Keanu Asing match up with current world number one JJF florence in a face off that many believed was decided before the starter horn sounded. However Asing looked nothing short of dominant right from the word go, surfing with precision to the judging criteria, putting together a sequence of critical and perfectly linked back hand turns on two expertly selected rip bowl lefts. JJF on the other hand looked out of sorts, struggling to pick the good ones, and faltering when he did. Medina sailed through his semi final against Kolohe Andino, looking just as sharp as ever. However when the horn sounded for the final medina came out swinging- in a tactic he told us before the comp started he has mirrored on Slater’s approach- launching a big backside full rotator. However unusually for Medina he came unstuck, putting him on the back foot. What followed were a serious of even more uncharacteristic errors including a seemingly foolish attempt to take off on the first wave of the set under Asing’s priority- a manoeuvre quickly snuffed out by the young Hawaiian, who took off inside medina, forcing him to kick out and take three of the best waves of the heat on the head. Asing is chaired up the beach by fellow semi-finalist Kolohe Andino as the crowd celebrates around him. The crowd erupted as Asing arrived back at the beach, with the rain failing to dampen high spirits ignited by a true underdog victory. And I imagine, along with surf fans and Medina haters everywhere, the copywriter who came up with the WSL’s now famous tag line ‘you can’t script this’ was feeling pretty pleased with himself too.